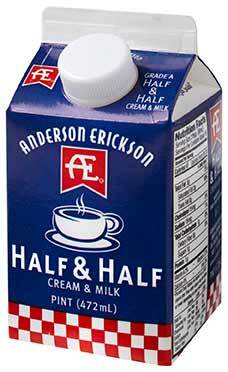 Since we receive milk daily from Iowa family farms, we have lots of fresh cream to make our Half and Half. Our Half and Half is not ultra-pasteurized because we believe this changes the fresh flavor. The result is a pure, fresh and smooth 50/50 blend of AE Milk and Cream because mathematically there’s no other possible combination. Oh, and we leave out the thickeners, added sugar and preservatives. AE Half and Half – it’s what a good cup of coffee dreams about.